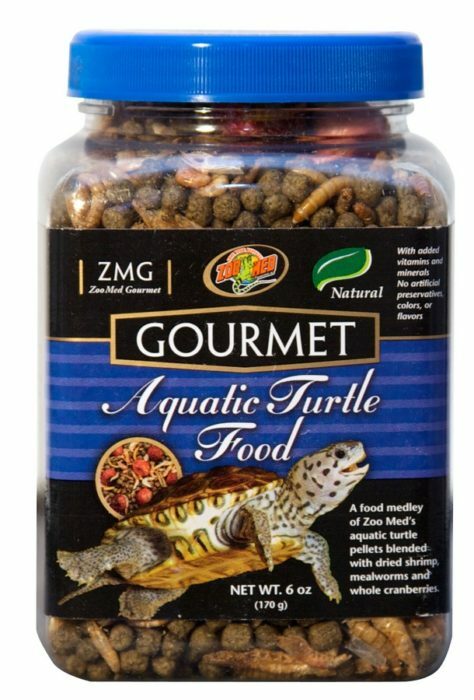 Gourmet Aquatic Turtle Food | Zoo Med Laboratories, Inc. Zoo Med’s Gourmet Aquatic Turtle Food adds a nice high protein treat to your turtles diet with the addition of dried shrimp and mealworms. We also add whole cranberries which are a natural food item of many North American species of aquatic turtles. Scientifically formulated to meet the dietary needs of growing turtles with a shell length of 2 to 6 inches. With added vitamins and minerals. No artificial preservatives, colors, or flavors. For hatchling turtles, use Zoo Med’s Natural Aquatic Turtle Food – Hatchling Formula. For adult turtles (7 inches and larger) you can supplement the Gourmet Aquatic Turtle Food with Zoo Med’s Maintenance Formula. Treat your pets to the best with Zoo Med Gourmet! Soybean Meal, Wheat Flour, Fish Meal, Sun Dried River Shrimp (Macrobrachium nipponense), Wheat Middlings, Corn Gluten Meal, Dried Mealworms (Tenebrio molitor), Dried Cranberries, Kale, Fish Oil, Lecithin, Dicalcium Phosphate, L-Ascorbyl-2-Polyphosphate (source of Vitamin C), Choline Chloride, Vitamin E Supplement, Niacin Supplement, Calcium Pantothenate, Riboflavin, Thiamine Mononitrate, Biotin, Pyridoxine Hydrochloride, Folic Acid, Vitamin A Supplement, Vitamin D3 Supplement, Vitamin B12 Supplement, Manganese Sulfate, Zinc Sulfate, Ferrous Sulfate, Copper Sulfate, Sodium Selenite, Potassium Iodate, Propionic Acid (a natural preservative).